Google CEO Sundar Pichai credits Amazon with paving an early path for consumer virtual assistants, but the company's first response to Amazon Echo, Google Home, could eventually play an important role in the business world. Last week at its annual Google I/O developer conference, the company announced Google Home, a voice assistant that's expected to be released later this year. During the event Google showed off Home features designed to automate everyday rituals and common domestic tasks. "We want users to have an ongoing, two-way dialogue with Google," CEO Sundar Pichai said during an I/O keynote address. "We think of this as building each user their own individual Google." Google Home will give the company near-ubiquitous access to users' home lives, enriching its ability to capture advanced user data about preferences and behaviors. While Google has not yet positioned Home as a tool for the enterprise, it could evolve into a valuable tool for business users that connects to Google's cloud services and other productivity platforms. "There might very well be a space for [enterprise]," said Urz Holzle, senior vice president of technical infrastructure at Google. "With cloud services you can actually get pretty far," when it comes to image and voice recognition, machine learning, text analysis and storage analytics, he said — all of which play increasingly important roles in business. Voice-activated devices and related applications will quickly make their ways into organizations as they become more mainstream for consumers, according to Raul Castanon-Martinez, a senior analyst at 451 Research. "There are many ways in which the different technologies used for Google Home can come together to enable workers to interact with enterprise applications," he says. The voice-controlled personal assistant is "the new battleground for mobile and IoT platforms," Castanon-Martinez says. Many of the tech industry's largest companies have shifted priorities in attempts to establish themselves in the nascent space, but Microsoft and Amazon currently have a technical edge, and Apple has the lead on brand recognition with Siri, which dates back to 2011, according to Castanon-Martinez. However, Google also has a "significant advantage" because of vast Android user base, and its expertise in speech recognition and natural language comprehension, he says. 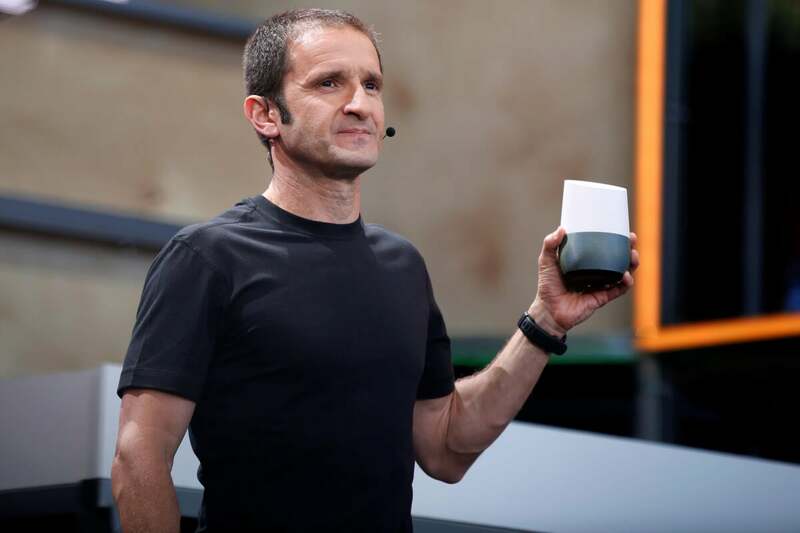 Jan Dawson, chief analyst and founder of Jackdaw Research, says Google Home represents another endpoint for several of Google's services, but it is much more niche than the company's other leading markets, such as smartphones, tablets, wearables, PCs and TVs. Google and others are so interested in these voice assistants because the home is "the one place where we tend to leave our phones behind to some extent," he says. "There's a role to be filled for devices that can be present when our phones aren't." Apple's answer is the Apple Watch, a device that's almost always attached to its owner. Amazon introduced a completely new category with its Echo assistant, because it doesn't have meaningful phone or tablet market share, Dawson says. "The key for this category is that these devices have to be seen as endpoints for services that exist in many other places too, rather than as self-contained devices." Samsung wants in on the voice assistant party, as well, and last month it announced Otto, a "smarter home companion" that can answer search queries, control smart-home systems and remotely monitor a residence. Otto is only a prototype, but the company was just as determined as Google to stake a claim in the market at its developer conference last month. It's not hard to imagine Google Home, or some version of it, finding a place in the enterprise, according to Dawson, but it would have to be tailored for use in work settings. "Enterprise use for this kind of thing is a lot tougher, because you're mostly talking about people working in busy environments, close to other people, which really isn't well-suited to voice products," he says. "That's not to say that the Google assistant won't make its way into the enterprise environment in other ways, but it probably won't be through voice." Natural speech tools have never caught on in the enterprise, according to Byron Galbraith, cofounder and chief data scientist at Talla, a company that makes an AI chat bot for business teams. "If I'm seated at a desk, I can almost certainly achieve the tasks I want faster within a graphical user interface or rich visual interface than through some limited set of voice commands," he says. Speech interfaces could be useful in hands-free scenarios, such as in factories or warehouses, but ambient noise can seriously limit efficiency, according to Galbraith. Smart home tech seems to have coalesced around voice-enabled hubs, because "voice creates an intimate, if stilted, connection which could drive greater brand affinity," he says. "It's not just an Internet-connected speaker," Galbraith says. "It's Alexa." Or Siri. Perhaps Otto. Or later this year … "OK, Google."